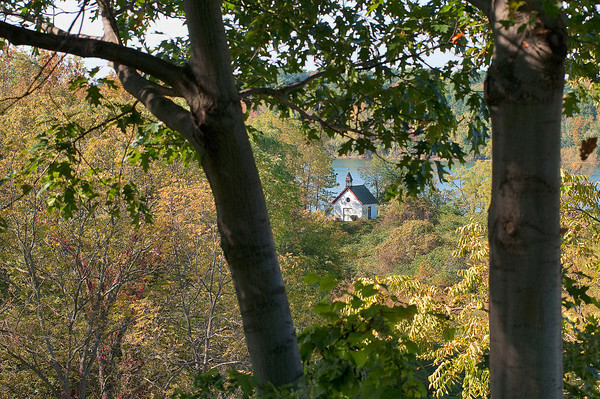 James Neiss/staff photographerLewiston, NY - Fall colors are beginning to turn bright near "The Little Chappel" at the Stella Niagara Preserve on Lower River Road. Representatives from the Western New York Land Conservancy announced that it was awarded $1,843,487 from the Habitat Enhancement and Restoration Fund towards creating the 29-acre Stella Niagara Preserve on the Niagara River in the Town of Lewiston. The Fund was created as part of the Niagara River Greenway from the Niagara Power Project Relicensing agreement. When combined with the $500,000 received from the Greenway Ecological Standing Committee earlier this year, the Land Conservancy will have received more than $2,300,000 of the $3,100,000 needed to create the preserve. When complete, the Stella Niagara Preserve will be the first nature preserve along the river to be owned and operated by a not-for-profit and will be a spectacular addition to the developing lake-to-lake Niagara River Greenway.